Hopefully, third time’s the charm for Sarah Kaufman (pictured). After watching Shayna Baszler and then Amanda Nunes bow out of their April 16 tango with various injuries, Kaufman will now grant Leslie Smith a rematch in the event. “The Ultimate Fighter Nations Finale” takes place inside Colisée Pepsi in Quebec City, Quebec, Canada. Kaufman initially dropped a split decision to Jessica Eye in her big league premiere. However, that October tango was overturned to a no contest after Eye flunked her post-fight drug test due to marijuana. The veteran took a split decision win over Smith in an Invicta FC bout before that. This marks Smith’s first fight for the UFC. 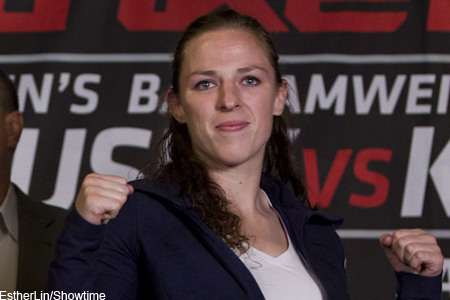 She’s looking to bounce back from December’s decision defeat to Barb Honchak. Fox Sports 1 will broadcast the main card live starting at 7PM ET/4PM PT.